It describes all major IDA features by starting at the beginning and going all the way to the end. Experienced users may be tempted to skip the first few chapters; resist this temptation and you will discover something new. It is very difficult to be detailed and precise when describing such a complex product. Chris does it excellently well. Handles real world malware, packers, and obfuscated code. 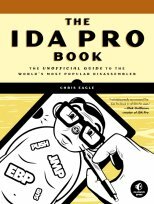 This is not just a collection of recipes or tricks, but will give you a better understanding of the IDA architecture, thus saving you from unnecessary frustration. Knowing the limitations of your tool is just as important as knowing its capabilties.